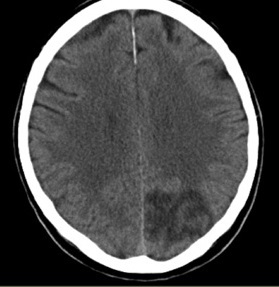 Occasionally there is no obstruction but a stroke has been caused by low flow which may be transient or fixed. If the reduction in flow was long enough infarction can result. 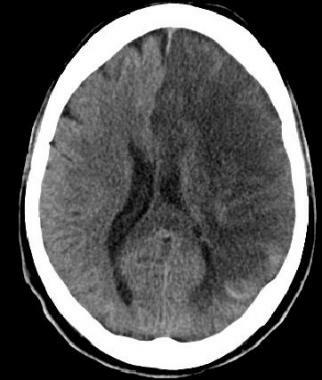 May be seen due perhaps to systemic hypoperfusion usually affecting the so called watershed areas between arterial zones and often in those with pre-existing stenoses e.g bilateral carotid artery stenosis. Once blood flow dips below a critical level for more than a few minutes then infarction occurs. Usual supply is 50 ml/100 mg/min of brain tissue when brain is "at rest". Below this changes are seen which are initially reversible but at a certain point become irreversible and cell death is noted. It's a good time to just also remember the concept of penumbra. When blood flow is reduced a core around the perfused artery which is obstructed will infarct but a surrounding area will just experience reversible changes if flow is re-established. 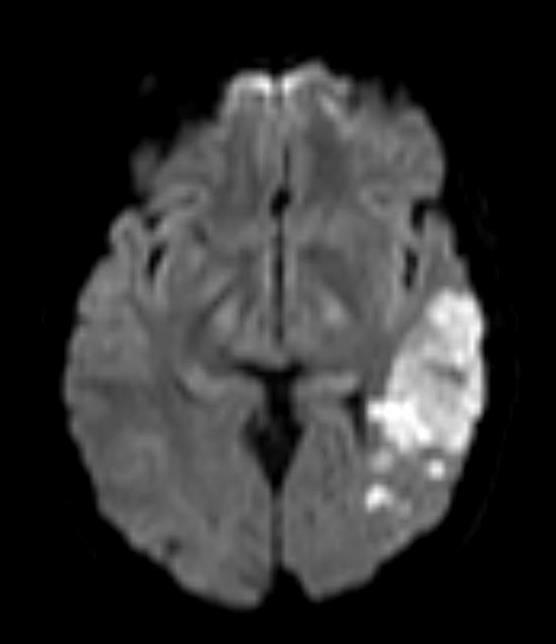 This is the penumbra and is the volume of the brain that we attempt to salvage with modern reperfusion strategies. A word of caution is that things are not always as clear cut as it seems. I have certainly had patients with quite evident large vessel disease e.g. severe ipsilateral carotid disease who seem to have sustained a lacunar type infarct which one presumes was small vessel. Has a thrombus or plaque blocked the ostia of a perforating branch. Difficult to explain. There are theories why this may happen but it is a good point to say that one cannot always be completely confident as to aetiology. There are always the exceptions that can trip us up. 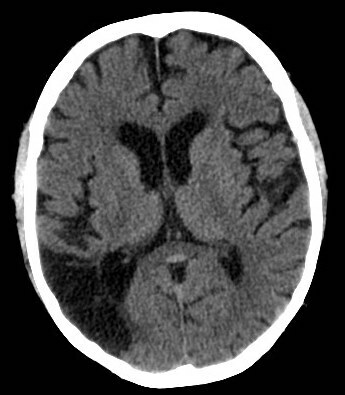 There have been attempts to classify strokes beyond the simple differentiation into infarctions and haemorrhagic. Each attempt has its own particular uses whether based on cause or clinical findings. The TOAST classification shown below has been well reference as it introduced a well quoted stroke classification. It would be wise to have heard of it. TOAST trial ( Trial of Org 10172 in Acute Stroke Treatment). The number of different mechanism involved in stroke are significant and are listed below. These will be dealt with in more detail in the next chapter. Atherosclerosis : intracellular collections of lipid within smooth muscle cells and macrophages. Arteriosclerosis: small vessel disease affecting arterioles associated with hypertension. Sub-endothelial hyaline (from mucopolysaccharides and matrix proteins) collection and Lipohyalinolysis which can lead to a weakened vessel and formation of small aneurysms. This can lead to either vessel obstruction or bleeding. 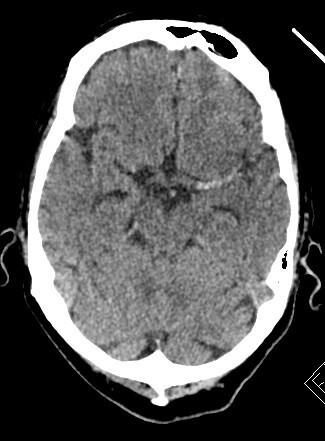 Thromboembolism: Plaque rupture and partial or total vessel occlusion by thrombus can then embolise and cane a much more distal obstruction downstream. Can also be thought of at more fundamental what actually happens and where and why. This is an attempt at a more anatomical level of aetiology. It is certainly not exhaustive. In summary the causes can be seen as arterial and venous thrombosis, embolism and low flow. Your understanding of stroke will improve if you refresh the anatomy of the pathway of blood from the heart to the brain. The anterior circulation is the brain supplied by branches of the carotid artery. In health the external carotid provides no significant supply to the brain. The posterior circulation is the brain supplied by branches of the vertebral artery. Carotid Arteries: Both ascend and bifurcate at the level of the thyroid into internal and external carotids. The internal carotids ascend through the base of the skull and through the cavernous sinus and then emerge to split into anterior and middle cerebral arteries. Vertebral Arteries: The vertebral arteries are the first branch of the subclavians arteries. They ascend and pass into the foramina on the cervical cord and enter the skull through the foramen magnum in front of the spinal cord. They ascend and fuse to form the basilar artery at the pontomedullary junction. The basilar lies in front of the pons and then splits again into the right and left posterior cerebral arteries at the midbrain level. Theses sweep back around the brainstem to pass to the occipital cortex. First review a few basics. Fibrin is a protein whose tertiary and quaternary qualities lend it to form a mesh that can form a physical structure that can stop bleeding. It is derived from fibrinogen. The serine protease enzyme thrombin converts fibrinogen to fibrin. A clot is formed. Eventually the body breaks down the clot - 'fibrinolysis' and the clot is removed. On the surface it seems simple but the reality is a complex interconnected set of events. First lets deal with some of the important players in thrombosis. 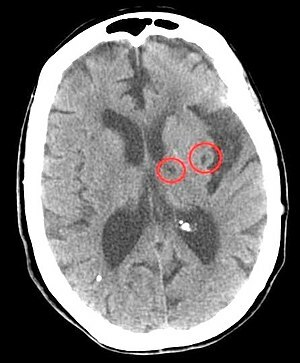 Note that thrombosis can include venous infarction as well as arterial. These are small discoid non nucleated cells containing granules. They are formed from megakaryocytes. Normal concentration is 150-450x 109/L. The surface membrane contains several important glycoproteins (GP). These include GP 1a which binds to collagen, GP Ib which binds Von Willebrand factor (vWF) and GP IIb/IIIa which binds to fibrinogen. The platelet surface is rich with invaginations increasing surface area. It is rich in granules. It also contains cyclo-oxygenase for manufacturing prostaglandins and thromboxane synthesis. Platelets discoid shape is maintained by microtubules. There are several types of granules. Alpha granules which contain Platelet Factor 4 and Platelets derived growth factor (stimulates vascular smooth muscle cells), VWF and Fibrinogen. Delta (dense) granules which contain ATP, ADP and 5HT (vasoconstrictor) and Calcium. Formation of a platelet plug occurs when vascular injury leads to exposure of subendothelial matrix to which platelets adhere. This includes GP Ia receptors which bind to exposed collagen. Plasma VWF binds the GP Ib receptor and also binds to endothelial microfibrils. This leads to platelets activation in which platelets become more rounded and release granular contents. Platelets release ADP and also Thromboxane TXA2 which causes activation and involvement of further platelets as well as localised vasoconstriction. This leads to formation of a platelet plug. Meanwhile locally released prostacyclin inhibits platelet activation and aggregation and vasodilates and limits the extent of clot formation. Locally Tissue Factor is exposed and this complexes to convert VII to its active form factor VIIa and activated the clotting cascade with the formation of Thrombin enzyme a serine protease. This converts fibrinogen to Fibrin close to the platelet plug. There is further activation of clotting factors and formation of clot. There is an intrinsic mechanism for breaking down and removing clots by the dissolution of fibrin into fibrin degradation products. This is carried out by the enzyme plasmin which is formed from plasminogen which is synthesised within the liver. Plasminogen binds to fibrin and is converted to plasmin by fibrin bound tissue plasminogen activator formed and released by vascular endothelium. As with clotting t-PA is inactivated by plasminogen activator inhibitor. Other Plasminogen activators can be found in urine - urokinase and also released by bacteria e.g streptokinase from streptococci.